Claire’s products are recognized and sold worldwide, and those same quality products are available to your company for a private label program. With a custom-designed label, it is easy to build customer loyalty and strengthen your brand with a line of Claire’s quality formulas. With more than 200 professional strength, high-quality aerosol and specialty products to choose from, Claire customers have the advantage of building and expanding their product lines without expense and delay. With over 100 years in the Sanitary Supply industry, Claire is an aerosol industry pioneer and has manufactured quality aerosol products since 1947. From air fresheners, cleaners and polishes to EPA-registered disinfectants, germicidals and insecticides, Claire’s high performance products are available to your company for private label. With Claire’s products, there is no delay or cost for research and development. Choose from our extensive line of proven products. Surprisingly low minimum order requirements. 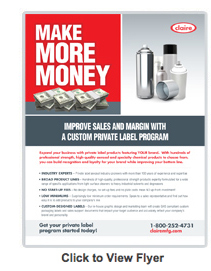 Speak to a Claire representative to find out how easy it is to add products to your company’s line. Our in-house graphic artists will create unique labels that will impact your target market and reflect your company’s brand. Our in-house professional staff makes certain our products, labels and MSDS meet the most current regulatory requirements. From custom branded sales sheets and fliers to other marketing material, Claire is there to assist.